That place is definitely Chicago’s Cadillac Theater and experiencing the magical production of Cathy Rigby is Peter Pan. During these recent periods of tragedy and very sad times where children are not permitted to be children and are forced to worry about things that no child or parent should ever think about. It is very refreshing to stop time and take two hours to forget about all of these sad events of the world. It is great for kids to be kids, and as an adult to take some time be a child again. I will have to say that experiencing Peter Pan as an adult did that for me. The story of Peter Pan is about a boy who refuses to grow up and takes you back to much more simpler times. It begins with the Darling family; the mother, father, three children, and a dog going about usual family life. Mother Darling has concerns when she tells the father she sees a strange appearance at the window and finds the shadow of the person who she saw in the window. She then places the shadow in a drawer. Mother wants the beloved family dog to keep watch for the children while she and the father go out to dinner. However, the father believes the dog Nana, should be kept outside. The mother still fearful goes to dinner with her husband and the children are left sleeping in their bedroom. While asleep, Tinker Bell the fairy who is a splash of light leads Peter Pan to the bedroom to retrieve his lost shadow. While there, one of the children, Wendy, wakes up and sees Peter Pan and helps him retrieve his shadow by sewing it on. Peter Pan then tells Wendy of the magic of fairies, and Never Never Land where lost little boys are taken. He explains that girls are too smart to get lost and this place really needs a mother to take care of them. 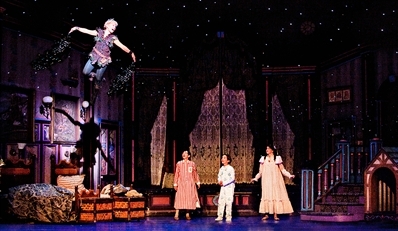 Peter Pan also tells of his ability to fly and wants Wendy to come with him to Never Never Land. Wendy is intrigued but asks if her brothers John and Michael can join them. Peter Pan agrees and sprinkles magic dust on all three children and their journey begins as they fly away. In Never Never Land they are met by the lost boys, Indians, pirates, a crocodile, and many other dangers. However, with Peter Pan, the children are able to overcome all of these challenges and ultimately return home to their family after their adventures. If this story were written today it would probably not have as happy of an ending and would be much darker. The simplicity of this story and the time it was written brings back the fantasy and magic that today’s children yearn for. Olympic Gold Medal Winner, Cathy Rigby brings forth the magic of this wonderful story. Being the age of 60 and having performed this show over 3100 performances, Cathy proves that you don’t have to grow up. Where many 60 year olds may slow down, Cathy proves that she can still be athletic and well toned and really enjoy being Peter Pan. I was not only amazed with her physical appearance, but with her agility on stage and in the air. I will have to say that I was exhausted just watching her performance and could only imagine doing this arduous performance over 3100 times and still look fresh. Aside from the physical performance, Cathy is able to pull off being Peter Pan and singing while performing the very physical choreography. What amazed me is that Cathy’s voice is really great and she sings and moves without being winded. Broadway actor and singer Brett Barrett, who is known for his performances in “Grand Hotel, “Annie Get Your Gun”, and “Chicago”, to name a few; was outstanding in his portrayal of Captain Hook and Mr. Darling. The comedy of the part of Captain Hook is very entertaining. Brett’s voice is wonderful and it is truly a pleasure to experience his fine performance. 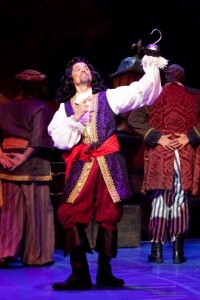 He portrays Captain Hook with flair and elegance, which is an interesting portrayal for a pirate. That is precisely what this part calls for. Captain Hook is a big stretch from “Pirates of the Carribean”. Sure Captain Hook is a pirate, but there was something lovable about him. 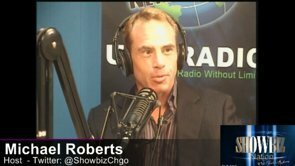 Brett Barrett performed all of these factors fabulously and he made the role fun and enjoyable. The performances of the ensemble consisting of the children, orphans, Indians and pirates were fabulous. The show was very tight and it was fun. The ensemble performed well together and individually. I will have to say that I was surprised to learn that the roles of two of the Darling boys, John and Michael were performed by girls. John was portrayed by Lexy Baeza, and Michael was portrayed by Hadley Belle Miller. Both girls along with Krista Buccellato who portrayed Wendy Darling were fabulous. However, it is hard for me to believe that the casting director had difficulty finding little boys to play these parts. Again, not minimizing the great performances of Lexy and Hadley because they were great and believable. In fact, I did not realize these parts were played by girls until I looked at the play bill. Additionally, the part of the sheep dog, Nana and the crocodile performed by Clark Roberts was extremely entertaining. Choreographer, Patti Columbo really did her magic with the great dance numbers. My favorite are the two Indian dance numbers which were acrobatic as well as creating fabulous dance moves. The staging and sets created by Scenic Designer, John Iacovelli were outstanding! Every time the curtain opened, I was amazed. Again my favorite was the opening sequence with Tiger Lily, played by Jenna Wright and the Indians. Just Beautiful! Director, Glenn Casale should be recognized and applauded as well. As I said earlier, this production with so much physical activity and singing was very tight and well directed. Last but not least, the musical direction under Conductor Bruce Barnes was excellent. The musical numbers were great, and understandable with great diction. Also there is something to be said about having a live orchestra at the theater. It provides the excitement and elegance that is required with a large theater production. In walking out of the theater, I felt 50 years younger and yearned to be that child again filled with so many happy child hood memories. It is my hope and prayer that parents will bring their children to this production and that the children will come out with the same happy feeling. Now is the time for that magic and innocence. Now is the time for kids to experience being kids and to enjoy their childhood. Just like Peter Pan says, “I won’t grow up”!